E-mail me with the information by filling out the form below and a FREE QUOTE will be provided to you. Upon acceptance of my quote, a service agreement will be sent and it will contain with your reservation date and pickup time. 30% deposit is required. In case of any repair, receipts will be kept and added into your final bill. Final payment is due immediately upon safe delivery of the vehicle. 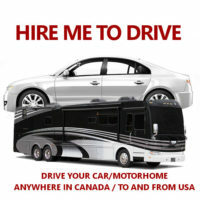 tags: Canada USA Driving, private driver, chauffeuring, motorhome driver for hire, car driver for hire, Canada car driver delivery, USA car driver delivery, motor home driver delivery.